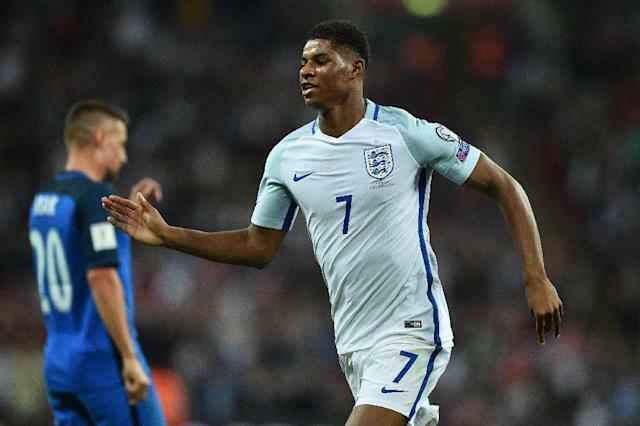 London (AFP) - Marcus Rashford atoned for a costly error to bring England a 2-1 home win over Slovakia on Monday that left them within touching distance of next year's World Cup. The 19-year-old was at fault as Stanislav Lobotka stunned a two-thirds full Wembley to give Slovakia a third-minute lead, but set up the equaliser for Eric Dier and then netted a sumptuous 20-yard winner in the second half. Victory sent England five points clear of Slovakia at the Group F summit and means Gareth Southgate's side need just two points from their last two games against Slovenia and Lithuania to seal qualification. "To come from behind against a side with very good footballers, particularly in midfield, we had to show character," said Southgate. "Marcus Rashford showed, like the rest of the team, great character. He made the mistake for their goal, but he kept persevering." England have endured turmoil since edging Slovakia 1-0 in their opening game a year ago, after which Sam Allardyce was felled by a newspaper sting and replaced by Southgate, but though they remain a work in progress, Russia now beckons. For all their neat passing and intelligent movement, Jan Kozak's Slovakia find themselves in a perilous position in the group, with both Slovenia and Scotland just a point behind them. "I'm sorry about the result, but the opposition were better, especially in the second half," Kozak said. "Before the double-header against Slovenia and England, we wanted to have the situation in our own hands before the last two games and we still have the situation in our own hands." While the group winners will qualify automatically, a two-legged play-off awaits the team who finish second. Slovakia face a pivotal trip to Scotland on October 5 and then close the group at home to Malta, while England host Slovenia in their next game before signing off with a trip to Lithuania. Rashford was rewarded for an enterprising cameo in England's 4-0 win over Malta on Friday with a starting berth, but the Manchester United forward's night began in forgettable fashion. He lost the ball to Lobotka and then failed to track the Celta Vigo midfielder's run as he swapped passes with Adam Nemec and ran through to steer a left-foot shot past the advancing Joe Hart. 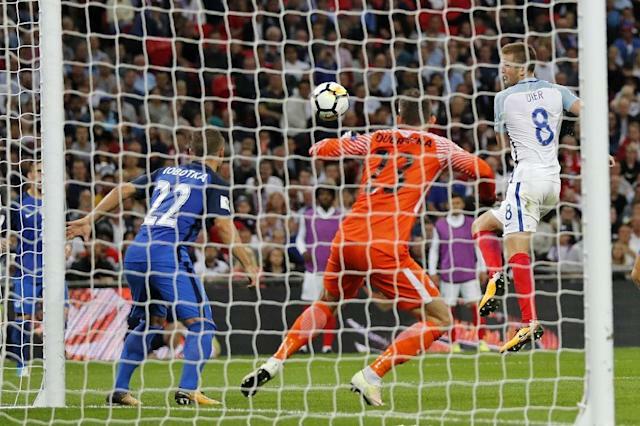 It was the first goal England had conceded in a home qualifying match since a Jordan Henderson own goal in a 3-1 win over Slovenia in November 2014. Rashford began to redeem himself in the 37th minute with a low corner from the right that Dier neatly flicked into the top-right corner after darting in front of Nemec at the near post. Slovakia goalkeeper Martin Dubravka was worked by Ryan Bertrand and Rashford as half-time neared, but England had a let-off when Kyle Walker escaped punishment for bringing down Vladimir Weiss as he bore down on goal. The visitors served a reminder of their threat 10 minutes into the second half with a slick break that culminated in Marek Hamsik crossing for Nemec, who chested the ball down and drew a smart save from Hart with a lusty volley. But after Harry Kane had cleverly worked some space inside the box and forced a parry from Dubravka with a low shot, Rashford completed his atonement act by putting the hosts ahead in the 59th minute. After Alli won the ball back mid-way inside Slovakia's half, Henderson worked the ball on to Rashford, who took a touch and then unleashed a vicious, dipping shot that flew inside the left-hand post.